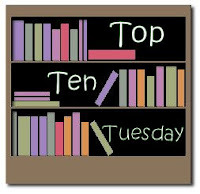 The Broke and the Bookish : Top Ten Tuesday -- Jamie's Top Ten Favorite Book Blogs! Top Ten Tuesday -- Jamie's Top Ten Favorite Book Blogs! 1. Dead White Guys -- Ok, in all honesty, this might be my favorite blog ever. I read a variety of books but the classics have a special place in my heart. DWG is a HILARIOUS blog reviewing classics and other bookish topics. The discussion on this blog rivals no other. 2. Boston Book Bums - I read from pretty much every genre so this blog is great for me! This merry band of bibliophiles from Boston are constantly cranking out quality reviews and posts on fun, bookish topics. 3. Good Books and Wine - I have two places that I always turn to when I need my YA fix. This is one of them. April reviews more than YA but the majority of reviews are of the YA genre. I can always count on her reviews to lead me towards good YA. 4. Tutor Girl Reads - Great reviews from a variety of genres! I can always count on a quality review here and I love that this blog doesn't have any memes. Sometimes it is nice to get away from that. 5. English Major's Junk Food - Awesome blog from an English major who isn't afraid to read books that are typically looked down on by English majors. I love this blog because of the variety of genres reviewed and I love hearing about her internship experiences! 6. A Lit Major's Notebook - Love this blog. It used to be called A Victorian Heroine or something like that. She reviews mainly classics but has really great bookish posts in addition to them. She is also a writer and I like reading about her experience! 7. A Literary Odyssey - Mostly classics are reviewed on this great blog! She has made a challenge for herself to read through a list of classics! Definitely inspiring me to do the same! 8. The Prairie Library - Love this variety on this blog! (Can you tell that I happen to love variety on a blog?) Great reviews and great posts about bookish things. 9. Roof Beam Reader - The lone male book blogger on the list! This blog is new to me and I'm so happy I found it recently! He reads great books and talks about important bookish things. I love his feature called Saturday Uncensored in which he discusses banned books! 10. The Story Siren - I mentioned that I have two go-to blogs for my YA fix. This one is the other one. This blog is so awesome and I'm in love with the layout! That isn't generally what I look for in a blog but I can't help but be superficial and think her layout is beautiful. She hosts the meme In My Mailbox in addition to YA book reviews, giveaways, author interviews, and more! And I keep thinking of a few more that I want to list. Meh. I'll be spotlighting my favorite blogs every week on my personal blog so you can be sure to check out all the blogs that strike my fancy. What are YOUR favorite book blogs? What makes a blog a favorite for you--a variety of content, a specific genre/an array of genres, a witty blogger, etc? Awww, yay I feel so special being listed on here. I just came across DWG the other day, what an awesome blog. Seriously, makes the classics way more fun! Wow it took a long time to compile this list! These are all certainly great blogs and a wonderful inspiration to the rest of us. Thanks so much for mentioning me! And I have to say, a lot of the blogs you mentioned are my favorites as well! This was hard! But it is a great idea, as it helps to get to know blogs that you may never have found otherwise. Thanks! I love DWG, she made my list. I admit I follow blogs sometimes just because of thier beautiful layouts :) Thanks for this list, I have been looking for some blogs with more variety instead of just YA so I will check some of these out! Wow, thanks so much for mentioning my blog! I'm flattered and grateful. Some of these blogs I'm already following, and others I will definitely be checking out, thanks to your great descriptions! I also read a few of these blogs ... great list! I loved this week's top ten! Hey, great list! Can't wait to check them out. I'm doing a book giveaway on my blog and thought you might be interested! Check it out here: http://amandarosetew.blogspot.com/ But hurry today is the last day to go in the hat! Seriously, though, this is an awesome list and, admittedly, a great motivator. Hopefully I can reach some of these bloggers' level one day. When I am looking for great list of book blogs. The first blog that will come in my mind is this blog. I love all the list that you are posting. Thank you for sharing it. Great list! I discovered a bunch of cool new blogs. I love Dead White Guys too. Great stuff. Oh, wow, I just saw that you posted my blog here! Thank you so much! I was wondering where the new followers for my blog came from, haha. I love all the work you guys do here and I'm so glad that you enjoy my blog, too! I love this meme. I'm adding it to my list of blog drafts in the hope that I can participate soon. This sounds like a cool meme. I will begin participating next week. BTW I found you thru the hop and am now a follower.